If you like what we do then please do consider donating. We are a non-profit organization (registered under French law) and will be able to pursue our goals with your help. 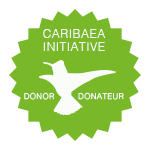 There are two ways you can donate to the association: by supporting a project or by becoming a “Friend of Caribaea Initiative” with an annual donation. Caribaea Initiative works towards developing research and higher education on animal biodiversity and wildlife conservation in the Caribbean. Our success depends largely on private contributions, which allow us to consolidate our actions to further conservation efforts for Caribbean biodiversity. By making a donation, you are helping us to protect the Caribbean biodiversity and to support educational programs. This part of the page is under construction, please come back later or contact us by email. Thank you for your understanding. For this second edition, we’ve selected 14 sumptuous photographs presenting several Caribbean fauna species, ranging from the crab spider through the hispaniolan woodpecker to the grey kingbird. 70% of the funds raised through the sale of this calendar go to support the development of conservation projects in Haiti. The remaining amount will be distributed on other ongoing research projects in the Lesser Antilles. We develop specific educational resources (documentaries, slideshows, posters, and questionnaires) in collaboration with institutions and associations in the Caribbean to educate college and high school students about Caribbean biodiversity conservation. If you want to support this project, please don’t hesitate to contact us. Caribaea Initiative offers different fellowship programs to native and resident young students of the Caribbean region who are motivated in becoming future regional experts in key disciplines of wildlife conservation biology. Actually, our budget allows us to support five students through masters and doctoral grants but we would like to do more… If you want to help us strengthen our training grant scheme, please don’t hesitate to contact us.